Small Woodland Owners' Group » Blog Archive » Scything – A great alternative to the two stroke petrol engine! You are here: Home > > Scything – A great alternative to the two stroke petrol engine! Earlier this year, SWOG went down to the Westonbirt show to meet members in that part of the country and promote the group and small woodland ownership in general. Afterwards we were kindly hosted by Nigel and Elaine from Lapwing wood and their neighbour Mike. Mike introduced us to the fine art of scything. Both woodlands are very young and hence still have a lush herb and grass layer. To keep this down to a manageable level, Mike prefers the gentle ‘swish’ of his scythe to the noisy polluting two stroke brush cutter. Having tried it, I can understand why! It is a very gentle exercise, yet relaxing and calming at the same time. I thought it would be a good idea to orgainise a SWOG workshop and open it up to members, but I recently found out that sycthing is recieving a resurgence of interest. 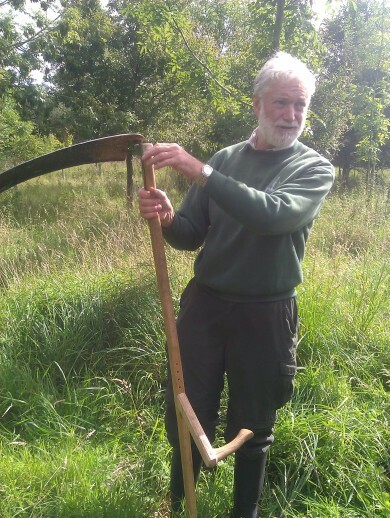 “There is quite a revival of scything in the UK. We seem to have made progress on grass cutting techniques, but use for cereals etc is less “polished” – the skills really have almost disappeared. More details can be found on the Sycthe Association’s website.